Whenever I go to New York, I always seem to wander into the Public Library on Fifth Avenue, scaling the staircase past the famous lions. But I haven't spent that much time at the BPL. Another case of overlooking the places in your own backyard. Boston's library has its own lions, flanking the Main Staircase inside the Dartmouth Street entrance. The interior of the original building, the McKim Building (named after its architect Charles McKim), is spectacular. Its marble and murals provide a palazzo feel to the building. The main reading room, Bates Hall, is on the second floor. The room runs the length of the building. Book-lined shelves ring the room. Sun filters in through the large, arched windows. A barrel-vaulted ceiling soars above. As far are you can see are table after table with dim reading lights glowing behind their green shades. It's a true cathedral to learning and a very inspirational place to do your research, reading, or studying. One of the nice features of the Boston Public Library compared to New York's is the central courtyard, which also has an Italian feel to it. The bubbling of the courtyard's fountain and the shaded seats along the walls provide a great place to take a break or a nice change of scenery to keep doing your work. The library was expanded in the early 1970s, and the addition contains the main stacks of circulating books. The addition was designed by Philip Johnson, the American architect best known for the Glass House, and is referred to as the Johnson building. Unfortunately, the interior of this part of the library looks pretty beat up and doesn't provide nearly the same experience as the McKim Building. The library provides art and architecture tours every day except Wednesday. There are also rotating exhibits to check out. And you don't have to be a resident of Boston to get a library card (you do have to be a Massachusetts resident). Anyone without a card can get a courtesy card to use any of the research facilities at the library. Last week we went to Salvatore's, located in the South Boston Seaport area. It's the latest in a string of new restaurants that have opened in this growing section of the city, such as LTK (Legal Test Kitchen) and Wolfgang Puck's Water Cafe in the new Institute for Contemporary Art. A Morton's steakhouse is coming soon. Salvatore's was launched by the owners of Sal's Pizza, which has numerous locations in the Boston area. Pizza is definitely a staple on the menu at Salvatore's. There are 12-inch gourmet pizzas (I had the Italian lover with prosciutto, sweet capicola, and caramelized onion.) along with Sal's signature 19 inch, 3-pound pizzas. There are plenty of pasta dishes and entrees, such as veal or chicken parmesan, marsala, and saltimbocca. Most entrees are between $15 and $22. We went on a Thursday night and had about a 20 minute wait, not too bad. Lunch has been busy since the restaurant opened, particularly since take-out is available. There is a bar with a couple flat-screen televisions. It's a good thing the screens are flat, since the space in Salvatore's is a little tight. At least the night we were there, we were seated next to a large party and there was barely any room for the waitstaff to squeeze by. And after having added to your waistline with a good Italian meal and a couple bottles of Peroni, you may need a little more room to squeeze by. Salvatore's is at 225 Northern Avenue. The Old State House is the oldest surviving public building in the city, having been built in 1713. It was the seat of royal government for Massachusetts, and then, after the Revolution, it became the seat of the commonwealth's government until it left for the "new" State House in 1798. It was outside this building that the Boston Massacre occurred on March 5, 1770. The Old State House is now a museum. The first floor presents exhibits on colonial Boston and the path to revolution, and the second floor contains the chambers where the legislature and court met. There are rotating exhibits in the basement and in the chambers. A small vile of tea from the Boston Tea Party that was shaken from the boots of Thomas Melvill, one of the participants. In an interesting historical tidbit, Melvill was the grandfather of author Herman Melville. The Liberty Tree Flag, which was flown from the Liberty Tree elm to announce meetings of the Sons of Liberty. The British chopped the tree down in 1775. The flag is the oldest known red and white flag in the colonies and could be a precursor to today's Stars and Stripes. There's also a coat worn by John Hancock, who in addition to being the noted signatory of the Declaration of Independence was the first governor of Massachusetts, and a musket from the Battle of Lexington. One surprising artifact was on display in a temporary exhibit. 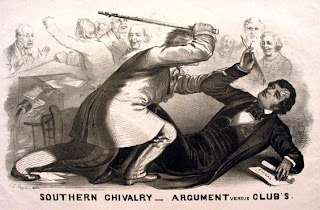 It was the cane used by Congressman Preston Brooks of South Carolina to savagely beat Senator Charles Sumner of Massachusetts on the Senate floor in 1856. (And you think political discourse in Congress is bad now?) It's one of those moments from history that has always fascinated me and to see the actual cane from the event was quite unexpected. If you visit, don't worry about the periodic rumbling underneath your feet. That's the subway, which goes underneath the basement. There's actually a vibration meter in the museum that registers with every passing train. A few weeks ago, a new Bunker Hill Museum opened in a former branch of the Boston Public Library across the street from the Bunker Hill Monument. As a kid, I always loved the three dioramas of the battle scene that were located in a small building at the base of the monument. These miniature patriots and Redcoats truly were toy soldiers pitched in battle. The dioramas have moved to the museum and now include a five-minute narration and light show that helps to explain what happened on June 17, 1775. The first floor of the museum explains the history of Charlestown and the construction of the monument. Particularly interesting are some of the designs that were rejected for the monument. The second floor covers the leadup to the battle, the battle itself, and the aftermath. There is a reproduction of a cyclorama painting of the battle scene, and swords, cannonballs, and a British drum are among the artifacts remaining from the battle. While there, I decided to tackle the 294-step climb to the top of the monument, and I think it served as a not-too-welcome reminder of my age. By step 100, my legs were burning and I was gasping for air. Now, I've done this climb as a kid and even in 90 degree heat with mono as a teenager and it was never this tough for me. (Or at least I don't remember it to be in which case the onset of senility reinforces my premise anyway.) The steps are numbered at intervals, almost mocking me as to my progress, or lack thereof. These periodic visits to attractions are a great way to benchmark your physical shape. The monument is still 294 steps as it always is; it was me who had changed. So had the view from the top since the last time I visited. The biggest change is the Zakim Bunker Hill Bridge, whose design reflects the obelisk monument on Bunker Hill. As the monument shows, sightseeing can be a good workout if you choose to do a lot of walking and stairclimbing. I always seem to drop a couple of pounds whenever I go on a sightseeing vacation, better than I do by just sticking to the gym. There is a company out there that offers "fatpacking" tours intended to help you shed a few pounds while hiking through the wilderness loaded up with a backpack. The wilderness is a little out of my element, so I like to stick to "urban fatpacking." Carrying a backpack with you as you do your sightseeing can help add to your workout. Just don't fill your backpack with soda and donuts. One of the quirkier events in Boston history was undoubtedly the great molasses flood of 1919. The circumstances of the flood are so strange, in fact, that some people think this is an urban legend. For the people involved, however, the story was only too horrifyingly real. In 1915, the Purity Distilling Company, a subsidiary of United States Industrial Alcohol Company, constructed a steel tank 50 feet high and 240 feet around capable of storing 2.3 million gallons of molasses. Shortly after noon on January 15, 1919, the gigantic tank that towered over the city's North End neighborhood exploded, sending a tsunami of the thick, sticky liquid into the city streets. Fifteen-foot waves of molasses plowed through the waterfront area at 35 miles per hour causing immense devastation. The final toll was 21 killed and more than 150 injured. The harbor remained brown from molasses through the summer. The tank's owner was eventually found liable for the faulty design of the tank, and one of the legacies from the disaster was stricter building codes, which we all now take as commonplace. The location of the tank at 529 Commercial Street is now the site of a baseball field. A small plaque marks the site. Stephen Puleo has written a fantastic book on the Great Boston Molasses Flood called Dark Tide. The book is a riveting read and filled with exquisite detail. Stephen also weaves the story about the flood into broader historical themes of the time such as the role of big business in the early 1900s, the rise of the anarchist movement, the onset of Prohibition, and the lack of power of immigrant communities in the U.S. I heard Stephen speak a few weeks ago about the flood at the Adams National Historical Site. Even though I had read the book already, the talk was still extremely interesting. Stephen says his goal is to present history without the dust, and he has succeeded in that. If you're looking for a good book on Boston history this summer, check it out.